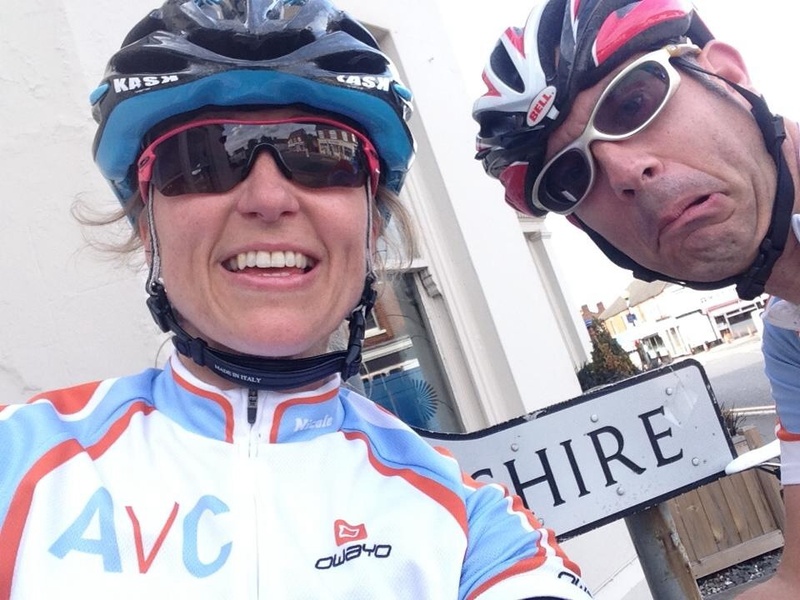 My club, Ampthill Velo Club meets up every Sunday at 08:00 in our town square, when the clocks change this moves back to 08:30 to allow for the darker mornings. AVC is unaffiliated, it’s a Sunday social ride. The group is all male except me and we ride 60 miles at an average speed of 17/18mph sometimes a bit faster depending on who’s on the front. Our group has some really strong riders and I credit my ability, my strength, power and endurance to riding with this group. Sadly I haven’t been able to make as many Sunday rides this year as last. My work took me abroad a lot in the early winter months so I lost fitness and I wasn’t fast enough to ride with them through spring. 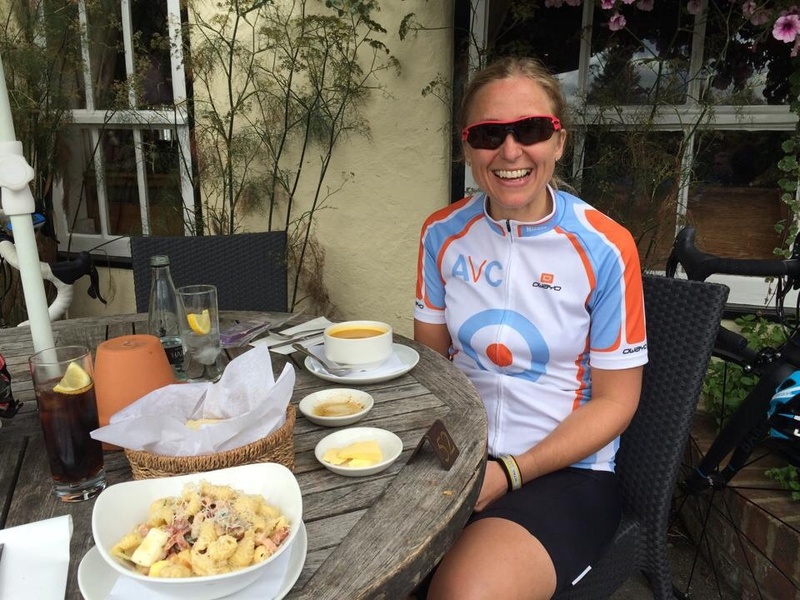 However I have been able to keep involved with the club via a club challenge, the AVC Grand Tour (GT). 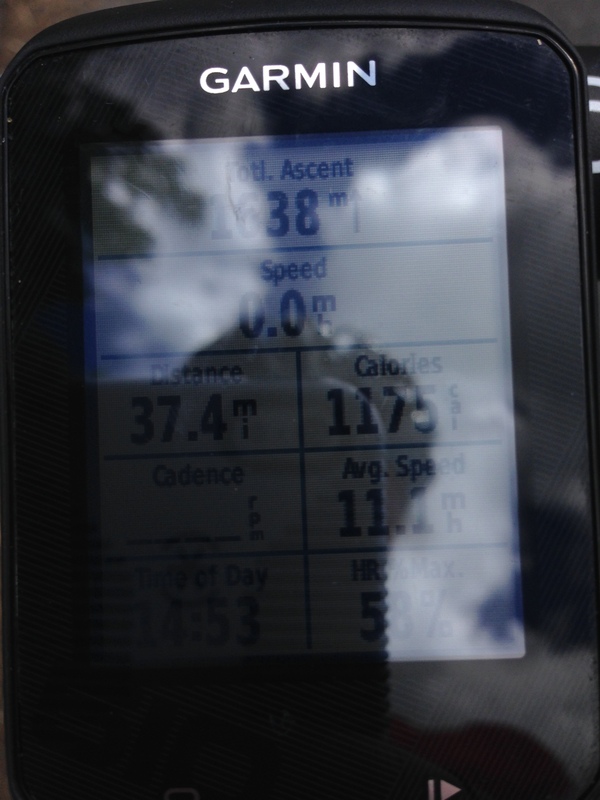 The GT uses a well known app that’s free to download but also has a premium service Strava. If you haven’t discovered it yet I would encourage you to give it a try. If you have a competitive streak (like me) be warned you may find it addictive. One of the club members conceived the GT, Martin and it’s all credit to him that we go out whatever the weather and ride as hard as we can to compete against each other for points. Being the only girl I compete against the boys, there’s no ladies competition, there wouldn’t be much point. 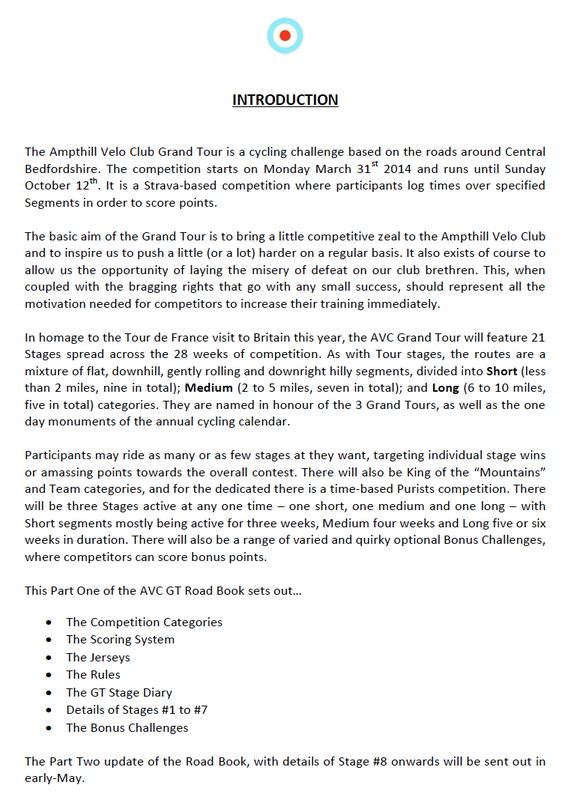 The AVC GT is a competition of stages and bonuses. 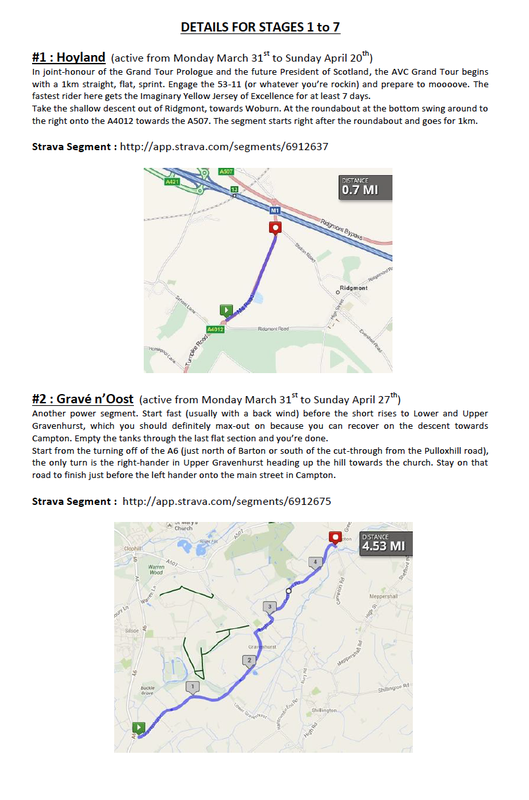 Each stage is a segment on Strava, a segment is a section of road that’s been mapped out by Martin that we must learn and ride. As we pass through the segment GPS tracks us, records our time, and puts us in to a leader board based on who’s ridden the segment the fastest. When we upload our ride (either using a Garmin or via the phone app) it lets Martin know we’ve riden the segment and the time we rode it in. On paper it’s a simple yet genius idea, it’s using modern technology in an brilliant way. It allows a very small, social club like AVC to have a timed, competition, riders can go out and ride the stages at their own convenience. Not knowing who is going to go out and ride next just adds to the dynamic of it all. Segments are live for approximately 2 – 3 weeks, sometimes more, sometimes less and they range from short sprints to long, lung busters of up to 9 miles with a bit of everything thrown in hills, fast flats etc. 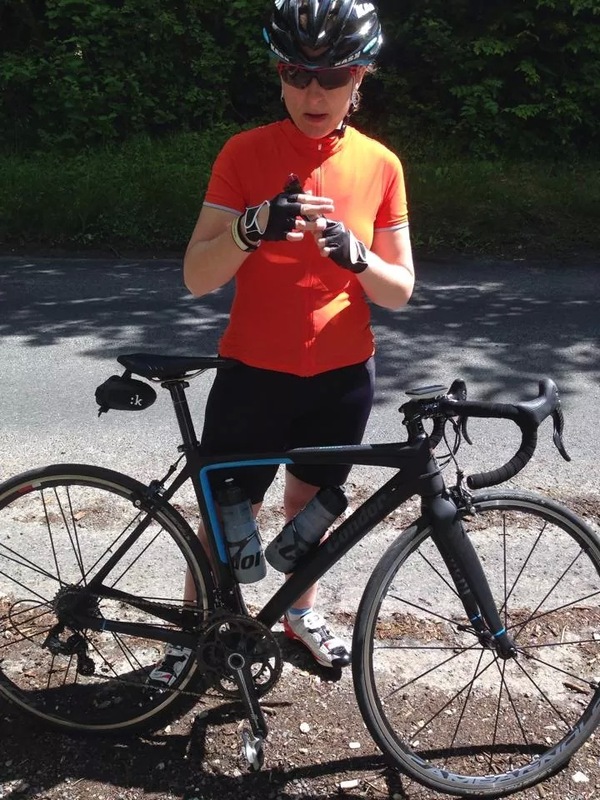 AVC has it’s own club on Strava so Martin can sort the leader by AVC so if another cyclist passes through the segment they can be excluded from the competition. However as with all Strava segments there’s always the hope that you’ll grab the King of the Mountain (KOM) or Queen of the Mountain (QOM) which is the No1 position overall on the leaderboard for that segment. Martin has spent hours going out riding and creating segments, discovering, reccing, and building the competition for us all to have something to focus on when we ride solo. 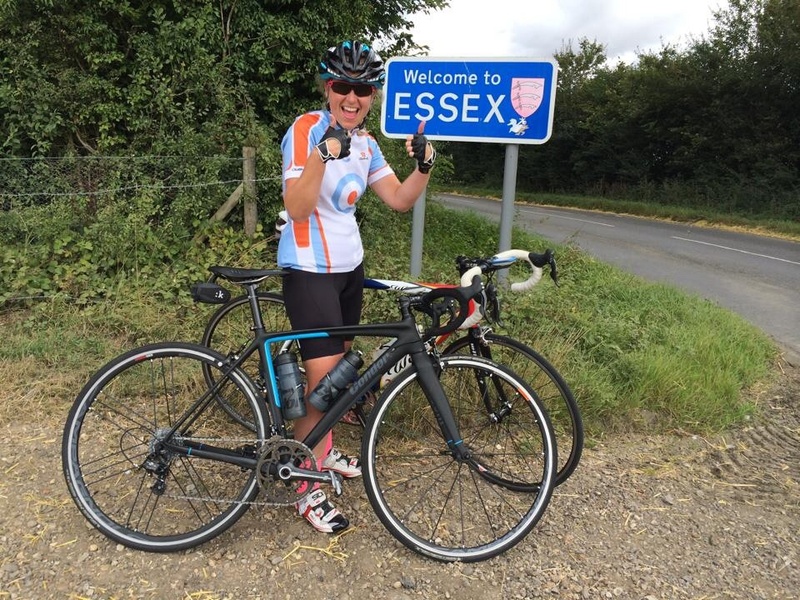 The GT takes us to local places we might not normally venture out to and some of the segments are quite complicated, riders have been known to go out and recce routes in their car or on their bike beforehand to learn the route. It’s become fairly serious. 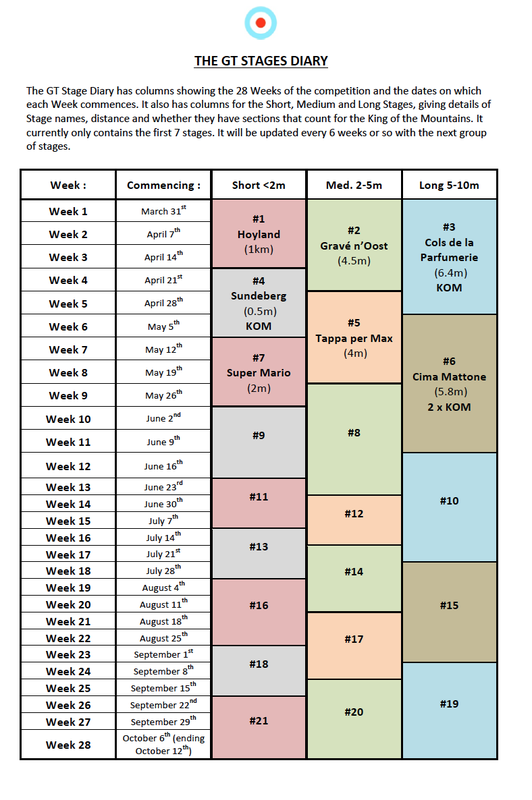 As well as the weekly stages Martin releases opportunities to win bonus points. 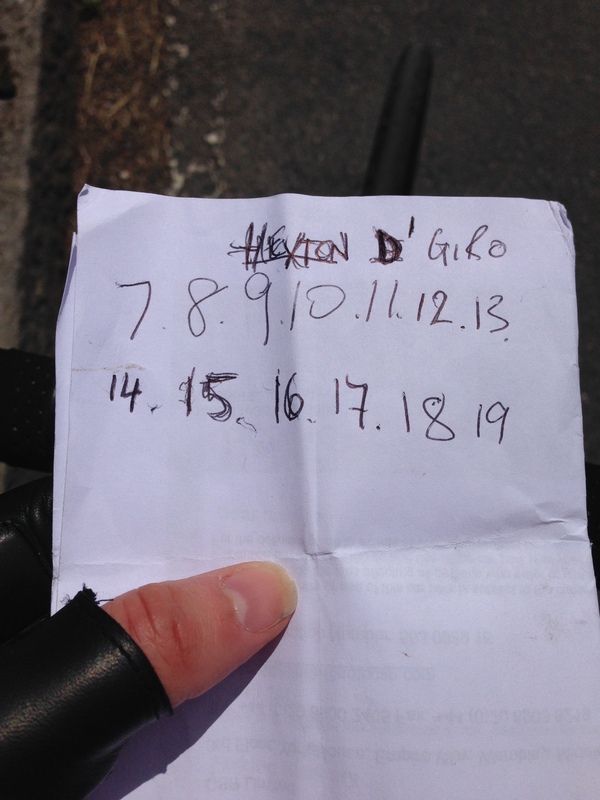 It was my quest for some bonus points that was a real moment in my cycling year. It was late on Saturday night and I realised that no one had done the Stelvio challenge. The Stelvio was part of the Monster hill climbing bonus challenge. 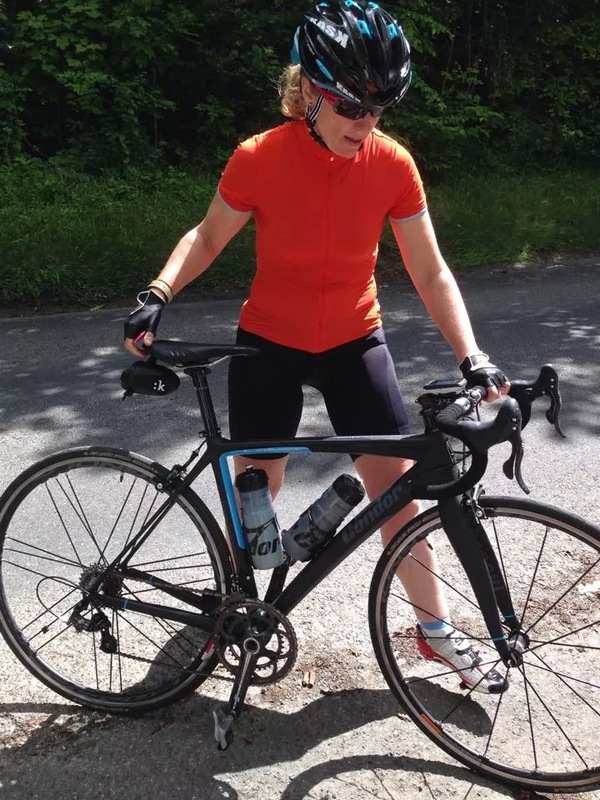 The idea for this challenge was born out of Everesting. 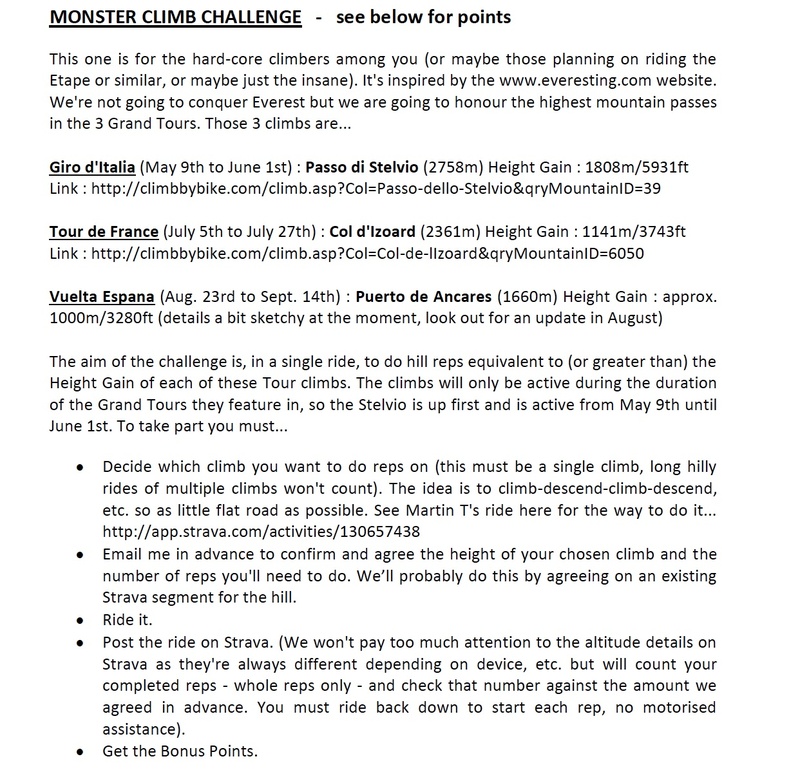 This challenge aimed to honour the highest mountain passes in the 3 Grand Tours. The first Grand Tour of the season was the Giro d’Italia so we had to equal the height gain of the Passo dello Stelvio 1808m/5931ft. We had to confirm in advance, with Martin what hill we planned to tackle, where we’d do our reps and agree the number of reps then it was up to us to go for it. I sent Martin an email hoping he’d get it in time. I was completely set in my mind I was going to do a stealth manoeuvre the next morning and go for the Stelvio. 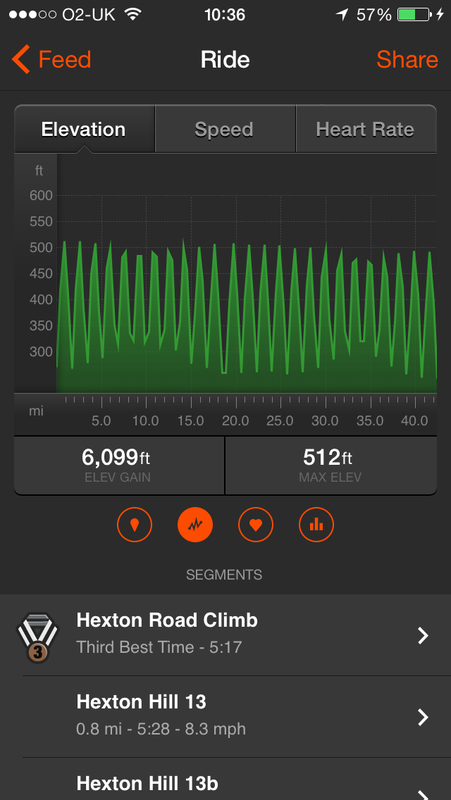 I picked Hexton, it was a hill I’d climbed many times before. It was steep enough maxing out at 8% and almost a mile long. The elevation gain required 25 reps from me but I had to keep a check on my Garmin elevation too as I didn’t want to do all that work and get disqualified for falling short of elevation gain. Luckily Martin replied, we agreed 25 reps of Hexton, he wished me luck and I tried to get some sleep with a head filled of nerves about what I’d taken on. 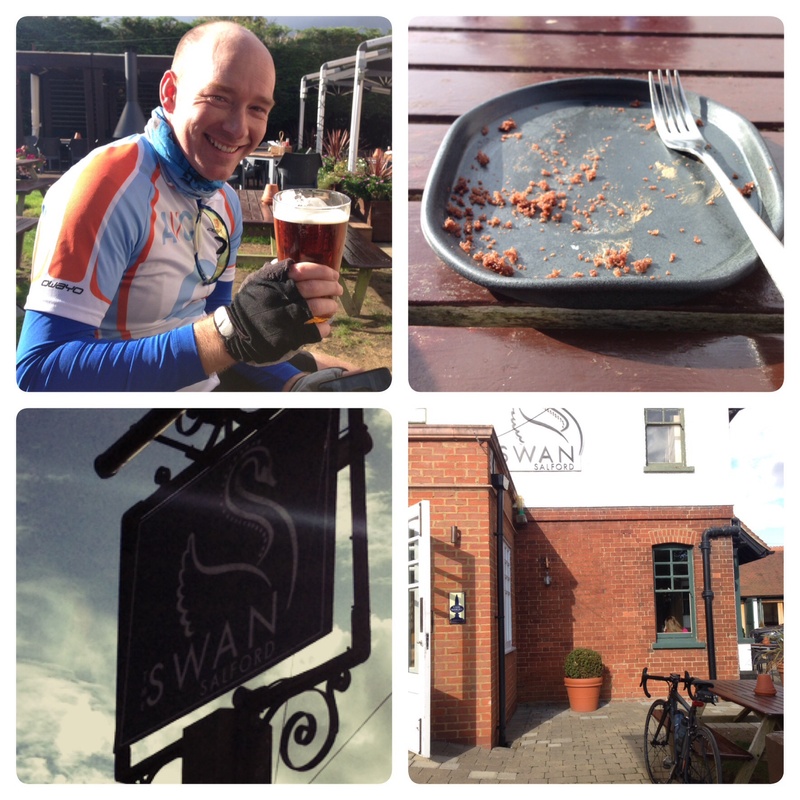 I set off the next day on my bike from home, it’s a few miles ride there and I figured I could do with the warm up. The weather was almost perfect, it was warm and the sun looked like it would make an appearance with a light wind. I let my family know my plans for the day and they said they would come later and cheer me on. After I’d completed 8 reps I got in to a good rhythm and knew I could do this, it was merely a matter of keeping my head straight as my legs were feeling strong but my brain was becoming completely twisted with each rep. I lost count on several occasions and had to start a tally chart with pen and paper. The repetition was surprisingly confusing, I started to think about what it would be like to attempt an everest, the number of reps would be over 100. Hexton is a busy hill with cyclists on mosts days, we don’t have many big hills in Bedfordshire and Hertfordshire so anyone that likes hills will ride here as it’s one of our longer ones. 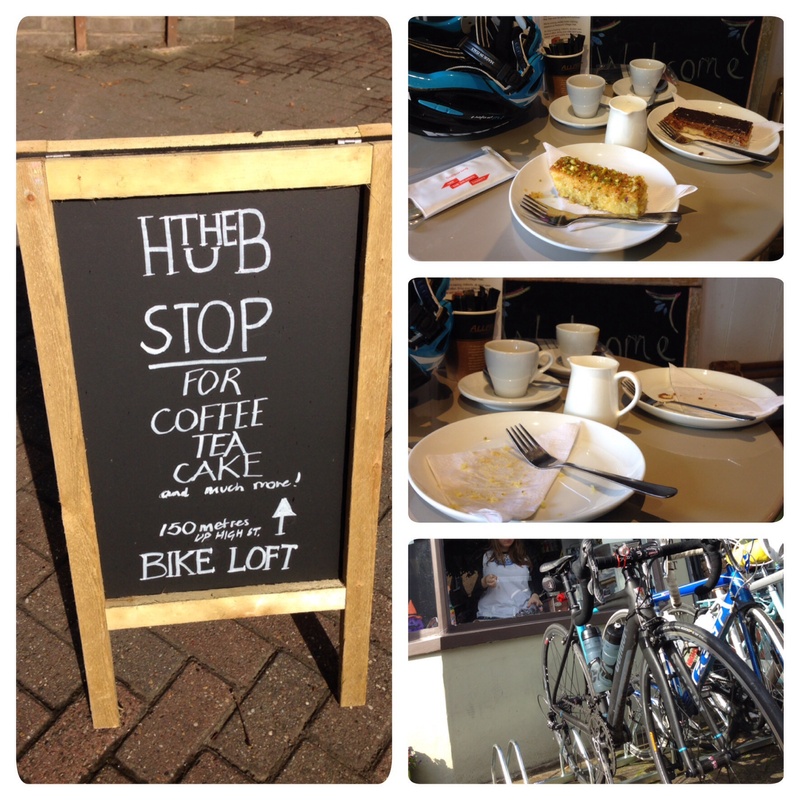 It was a real boost meeting and talking to other cyclists and letting them know what I was doing. They all thought I was completely mad but they all gave me so much support and encouragement. They would ride a rep with me and really cheer me on then say their farewells at the top as I would turn around for another descent. 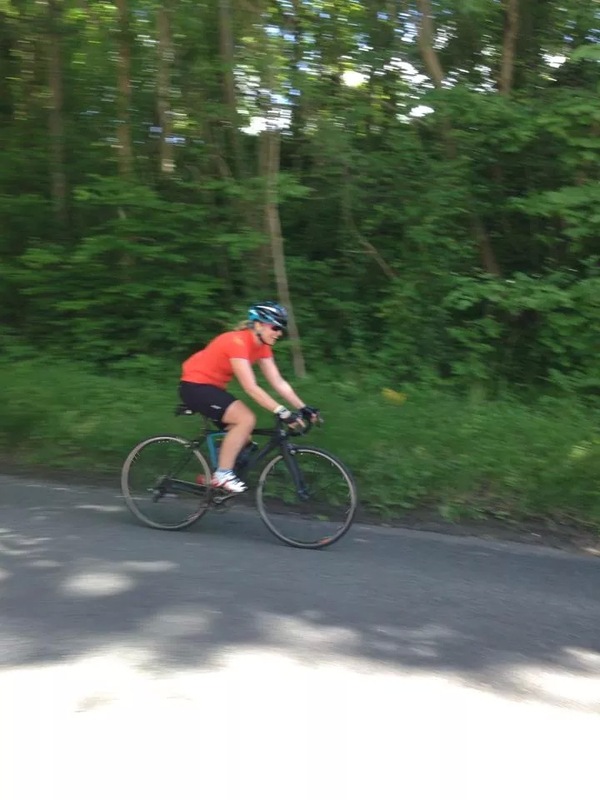 I preferred the climbs as the challenge went on, the descents became quite unsettling, my brain was so fragile from the repetitions and hammering down the hill. My family arrived as I was about half way through. My daughter was all big smiles and was only speaking a few words at this time but she was able to say “come on Mummy” and it spurred me on so much. I started taking a couple of minutes break between reps at this point, fuelling up regularly and taking on board a lot of fluids. The temperature was well in to the mid 20’s by now and my mind was completely scrambled but I was totally focused on completing the task. My family stayed for around an hour and after they left I felt quite low but I had 6 or 7 reps to go so I had to keep my motivation up and keep going. The passing cyclists were few and far between now as the day was almost over but every so often one would come along and I’d share my story and it would lift my spirits so high and get me to the top of that hill and keep me going for at least another rep.
What spurred me on to keep going that day was knowing that I would surprise the other club riders, the only person that knew I was doing the challenge was Martin. I’d tried to send him a couple of updates but Hexton is quite remote so the lack of signal stopped the texts and emails getting through. The rest of the club had no idea what I was doing. As I rode that last rep the excitement lifted my body up that hill like it was the first rep, I’d done it. I’d pushed myself up and down that hill 25 times. Every time I ride up Hexton now it surprises me that I rode up and down there 25 times but on that day I was in the zone, I was completely focused and I was fixed on completing that challenge. 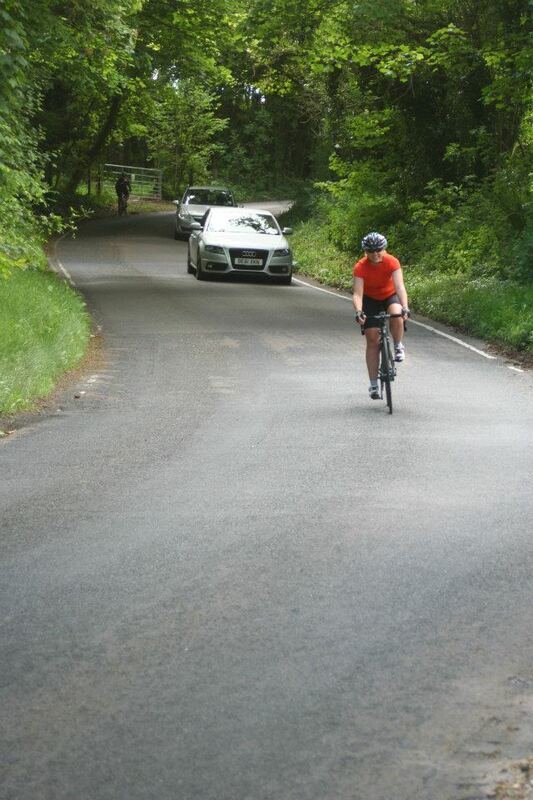 The GT has pushed my cycling efforts on a number of occasions this summer. For 5 bonus points I pinned on a number and took part in my first TT. 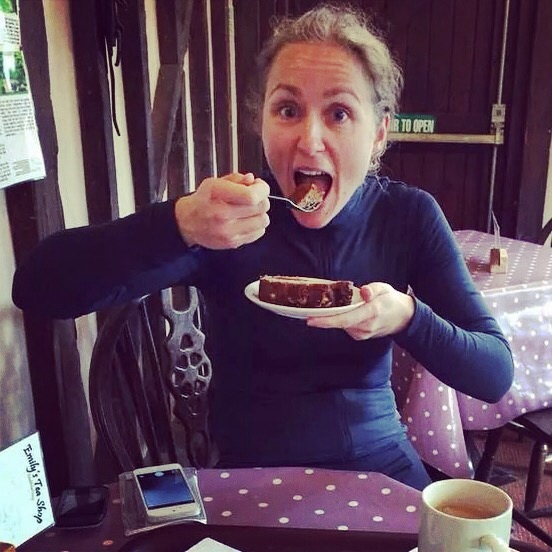 For 6 bonus points I rode across 5 counties Bedfordshire, Hertfordshire, Cambridgeshire, Essex and Buckinghamshire totalling an epic 106 miles and on the last day of the GT I completed the yummy 4 cake challenge on a wet and wild day. 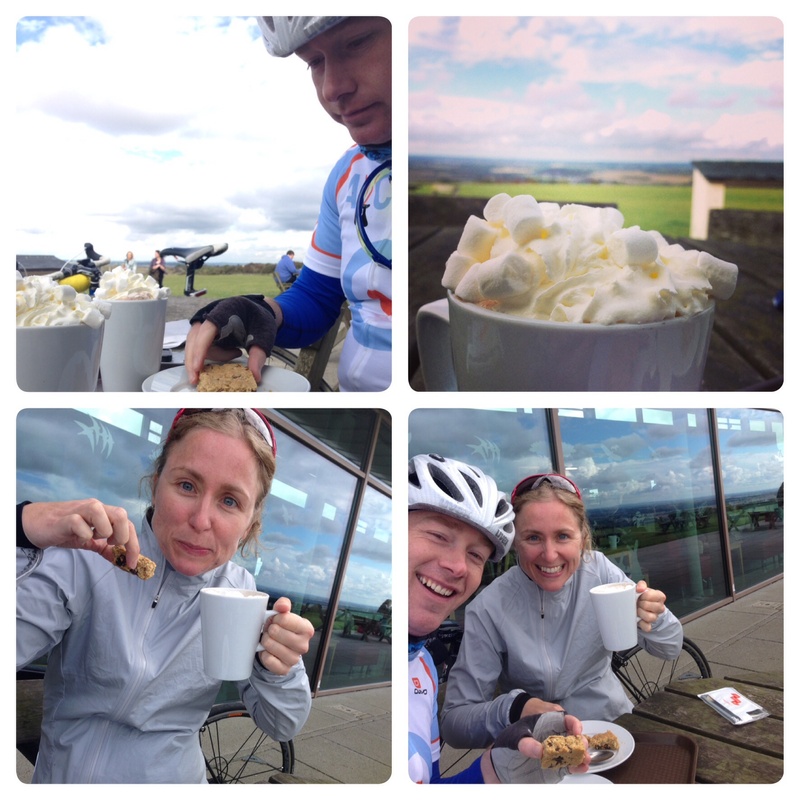 Riding 66.9 miles and stopping at 4 nominated cafes for a slice of cake in each for another 5 points.